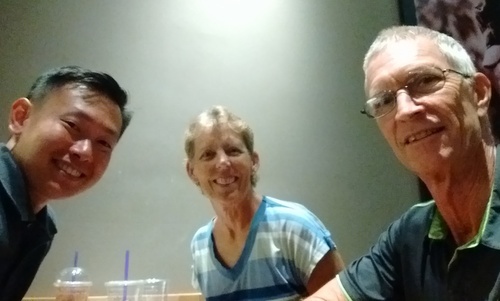 When we returned to Slip Away in Malaysia last October after spending the previous five months in the USA, we had big plans for the coming year. Slip Away would be getting a new paint job on her decks and cabintops, and then we wanted to cruise in Malaysia and Thailand for a couple of months before setting off across the Indian Ocean in May. But, as always our plans are subject to change. The paint job took longer than anticipated (mostly due to a very rainy season), and of course there were other repairs and maintenance items we wanted and/or needed to do to make sure Slip Away was in the best shape possible for her upcoming ocean crossings (plans were for Indian Ocean in 2017 and Atlantic in 2018). It's an unwritten rule that boat projects always take longer than expected, and time started "slipping away." Rather than stress out about making the optimal weather window for the Indian Ocean crossing, we made a new plan to stay another year in Southeast Asia. 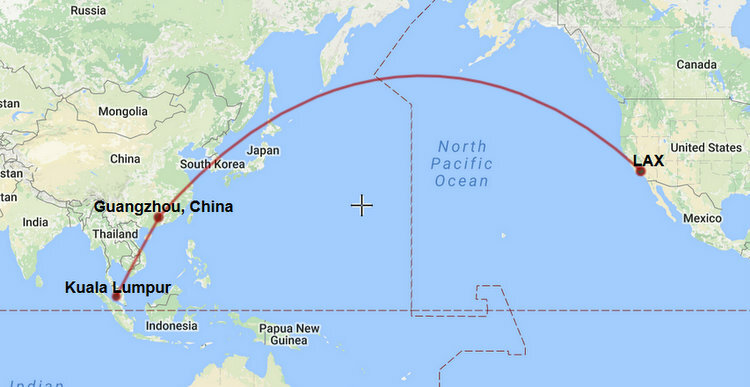 Malaysia is literally on the other side of the world from the USA, but our trip back to Slip Away went smoothly - a total of 26 hours of travel time, including 2 flights to get to Kuala Lumpur and then a 4-hour van ride to Lumut. 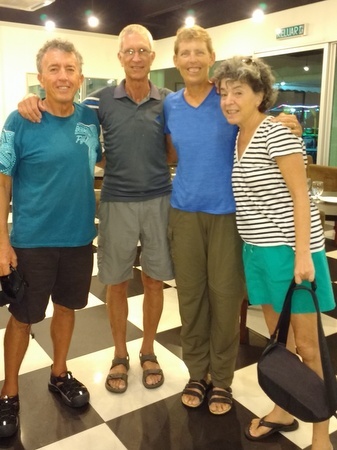 Prior to leaving the U.S., we had made arrangements to rent an apartment in Lumut while we worked on Slip Away, and the rental agency (Super Clean Holiday & Tours) sent a driver to pick us up at the Kuala Lumpur airport - only slightly more expensive and oh-so-much-easier than lugging our bags on a bus! We landed in KL shortly after noon, and by dinner time, we were settled in our apartment, with our rental car parked in our assigned space in the garage. We walked to a little bistro called Jook's Joint just a couple of blocks from our apartment, and celebrated our arrival with pizza and beer. After dinner, exhaustion set in, and we barely remembered our heads hitting the pillows that night. Although we would have liked to take it easy for a few days, we needed to hit the ground running. We dragged ourselves out of bed early the next morning and headed off to the boatyard to see Slip Away. We knew the Pangkor Boatyard wasn't far from our apartment, but to be honest, we didn't have any idea of how to get there! We called up directions on Google Maps and set off in our rental car - only to find ourselves driving into the Royal Malaysia Navy Base in Lumut. Oops! The officer at the gate was quite pleasant, gave us directions, and sent us on our way in the opposite direction. Cutting through the Navy Base would have been a shorter route to the boatyard, but unfortunately, that was not allowed. Slip Away was waiting for us where we had left her, and she had fared quite well in our absence - a little dirty on the outside, but no mildew on the inside, and no signs of bugs or other infestations - all good! We had contracted with a local boat painter named Jimmy (Prestige Marine) to paint Slip Away's decks and cabintops and were eager to get started on this project. We were also scheduled to go off on a scuba diving trip to Indonesia in just over a week, and we needed to do some prep work on the boat before we left. Our plan was to remove all deck hardware - stanchions, cleats, winches, clutches, handrails, trim and other fittings - before Jimmy started painting. After he finished painting, we would reinstall it all. We spent the next week removing the deck hardware - putting all the fasteners in zip-lock bags (over 100 bags!) and labelling every bag and every piece of gear that came off the boat because we could never remember where everything went. Additionally, we moved a bunch of stuff from the boat to the apartment, so every day we came home with a car load. By the time we left for our dive trip, we had about two-thirds of all the deck hardware removed. Jimmy's boys would start sanding the boat while we were gone, and we would finish up the hardware removal when we returned. Raja Ampat, Indonesia Scuba Trip (October 14 -31). When we sailed through Indonesia in 2015, we were captivated by the scuba diving at Wakatobi and Komodo National Park (in the central and southern parts of the island group). Raja Ampat in northeast Indonesia boasts that it is the "most bio-diverse marine environment in the world," and we were very excited to have the opportunity to dive there. Before we retired from our jobs go sailing, we used to enjoy vacations on live-aboard dive boats, but they are pricey holidays and don't really fit into our budget these days. 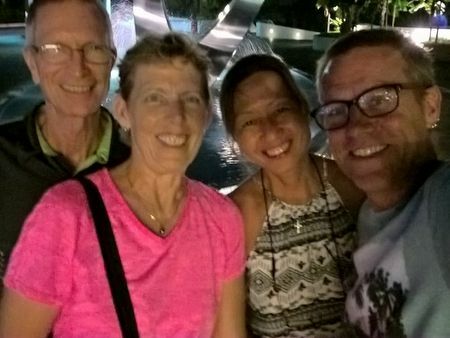 However, this trip was a gift from Jan's Mom, who left us a small inheritance when she passed away in 2014. We wanted to spend some of that money doing something special, and we booked a ten-day trip on the Raja Ampat Aggressor. Thank you Mom - it was perfect! The boat trip commenced from Sorong, Indonesia, and even from Malaysia, getting to Sorong was an arduous trip. 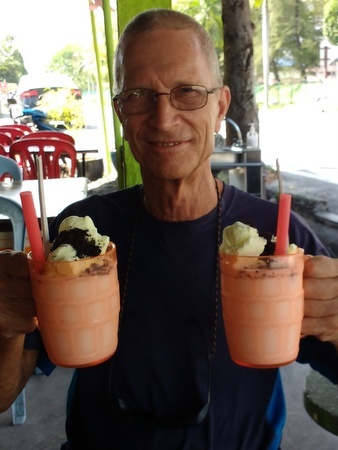 We flew out of the airport in Ipoh, Malaysia, which is just over 90 minutes from Lumut, so thankfully we were able to avoid the four- to five-hour trip to KL. From Ipoh, we flew to Singapore, where we had a layover of about 7 hours, so we ditched our bags at the airport and took the train into the city. We enjoyed a dim sum lunch at Tak Po in Chinatown and then caught another train to the botanical gardens. We had a lovely afternoon wandering around the gardens before heading back to the airport. That evening, we flew to Jakarta, then it was another flight to Makassar, and finally a third flight to Sorong, where we arrived at around 8 the next morning. We knew we'd be dead tired after those flights, so we arrived a day before the dive trip started. Hotel rooms in Sorong were cheap, so Jan booked us into the most expensive one in town - the Swiss-Belhotel (about US $45/night). The room was clean and quiet, the bed was comfortable, and it was worth every penny we paid for it! We slept all day, ate dinner at the hotel and then slept all night. The Aggressor staff picked us up from the hotel the next day and brought us to the boat, where we met the other 14 people with whom we'd be spending the next 10 days. All but one were American; there was one guy from Switzerland. 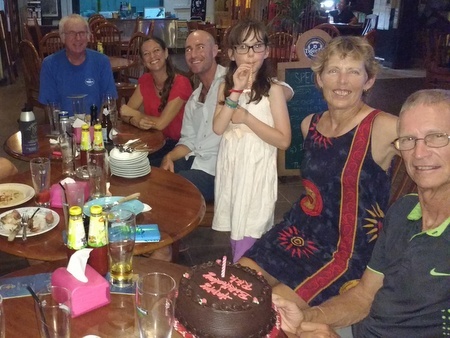 It was a bit of a surprise to us to have such a large contingent of Americans on a boat half-way around the world from the USA, but the Aggressor is an American company, and Raja Ampat's reputation is well-known among American divers. Half of our group were members of a dive club from Denver, Colorado, and despite Denver's landlocked location, most of those divers were quite experienced - several dive instructors and divemasters. Several folks on board had previously been diving in other places in Indonesia, and the Lembeh Straits in North Sulawesi is now on our wish list after hearing about the great diving there. While the diving in Raja Ampat was excellent, the last two "muck dives" in Ambon Harbor were our favorites. We love diving on beautiful coral reefs, but we have come to really enjoy finding unusual critters on muck dives, where there's no coral reef but either a black sand or silty bottom. We were thrilled to see several ornate ghost pipefish (a first for us) in Ambon, as well as frogfish, seahorses, and a blue-ringed octopus that put on quite a show for us. Even the divemasters got excited about the octopus. The time flew by, and before we knew it, the dive trip was finished. We spent a night in Ambon, and then flew back to Singapore. 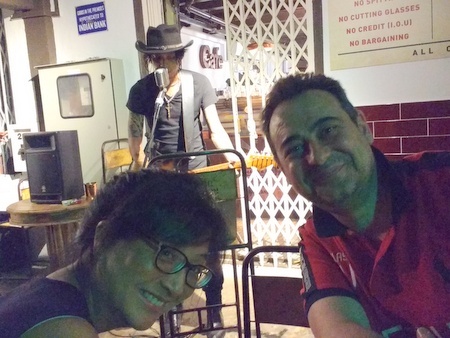 We stopped to spend a couple of nights in Singapore and visit with our friends Sivea & Mario who live there. In the short time we've known them, they've become dear friends, and we always enjoy an opportunity to catch up with them. Once back in Lumut, we were again hard at work on Slip Away. In less than a week, we wrapped up the deck hardware removal. When finished, we basically turned the boat over to Jimmy and his crew to do their thing. This project was a bit more than just a paint job because Jimmy's crew was sanding off the molded-in non-skid surface on Slip Away's decks and cabintops. Slip Away came out of the factory in 1978 with this non-skid deck surface, and we liked it, but as the decks were painted previously, the surface started to fill in and it became less non-skid. We used a non-skid additive (basically sand) the previous times that the deck and cabintops were painted, and that had worked well. But Jimmy recommended (and we agreed) that the best course of action at this point, was to sand everything down and apply a new non-skid surface. In a nutshell, Jimmy's crew sanded the decks and cabintop surfaces smooth, then Jimmy sprayed a high-build primer, and then the boys were back at it sanding and filling for what seemed like days on end, prepping for the paint - first two coats of gloss, then the non-skid surface application (paint with grit mixed in). When we made the decision to paint the boat in November, we thought it was going to be the dry season. The Selective Asia website asserts that "The wet season on the east coast (of Malaysia) is between November & February, which is when the west coast experiences sunny, dry weather." 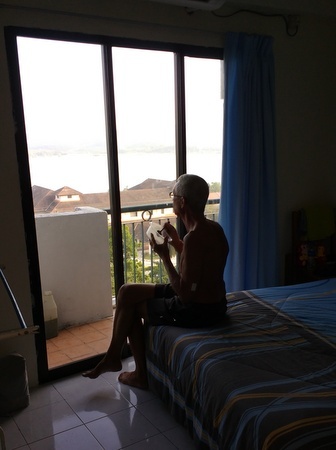 We were on the west coast of Malaysia from November to February, and it was not sunny, dry weather. It was very, very rainy, which delayed our boat work significantly. From the time we finished the hardware removal, it was two full months until the first coats of paint finally went on (in early January), and the non-skid was sprayed a couple of weeks after that. Unfortunately, the paint job didn't go perfectly, and Jimmy had to come back a few times to fix some imperfections. He was quite willing to do that - wanted to be sure that we were happy - but it all took time. And, everything took more time than expected because of the wet weather. It wasn't raining constantly, but we had at least one rain shower most every day, and it was often enough to interfere with the work. We had plenty to keep us busy while Jimmy and his boys were working (or at least trying to work) on Slip Away, and our apartment was our base of operations. We had rented a studio apartment, and were pleasantly surprised that it was quite spacious - about the size of two motel rooms - so we had room to work. We cleaned and polished all the deck hardware and fasteners, serviced the winches and other gear, stripped and put initial coats of varnish on the teak handrails and trim, and scrubbed our sunscreens in the spacious shower, as well as a number of other jobs, in preparation of putting everything back in place once the paint job was done. Our apartment came with a washer, and we took full advantage of it. Most of the clothes left on the boat had a musty smell to them, so we took them to the apartment and washed them all. We were also able to use our machine to wash most of our running rigging - halyards, sheets, preventer lines, etc.- much easier than a bucket! Rich servicing winches in our apartment "galley"
Our apartment was on the 11th floor of the high-rise Lumut Valley Resort Condominium building. We had a small balcony with a beautiful view overlooking the Manjung River and the Royal Malaysian Navy's Lumut Naval Base (the largest naval base in the country). Our monthly rent was MYR 900, or about USD $210. Most importantly, it was air-conditioned - it's incredibly hot and humid in Southeast Asia. There were several other boaters renting apartments in our building, so we had a little community. And, living on the 11th floor gave us an opportunity to exercise. On days when we were confined to the apartment working on boat gear, we made use of the stairs. Jan thought she was doing well with six sets of steps (11th floor to ground floor and back up), but Rich outdid her with ten! time in Lumut. The tug-and-tow traffic on the river was quite interesting. In general, the cost of living in Malaysia is quite inexpensive. Altogether, the cost for us to rent an apartment, rent a car and keep Slip Away at the boatyard, was less than what a berth in a marina in many places would cost. Malaysia doesn't have all the modern conveniences of the USA, but it's not a third-world nation either. The standard of living is good, and one can live quite comfortably here (as long as one has an air conditioner!). 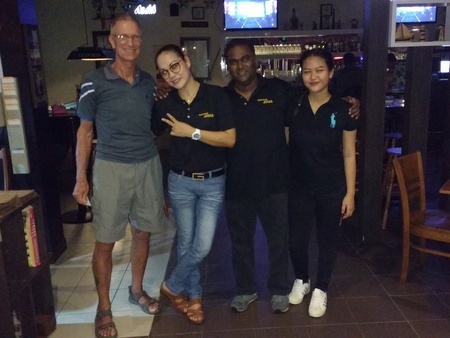 Our apartment was located in "Lumut Town", a 15-minute drive from the boatyard. Lumut Town is a local tourist destination, with a number of hotels and several restaurants within walking distance of our apartment, and it was usually quite busy on weekends and holidays. 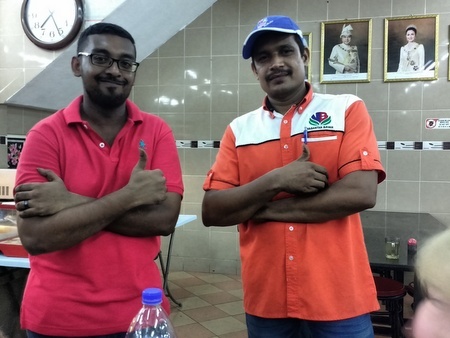 We weren't quite sure what the draw was to Lumut, but it did have a reasonably nice river walk, and the town sponsored a number of festivals and activities which seemed to attract the crowds. There is also a ferry terminal in Lumut Town to go to Pangkor Island, which is a short ride away and another popular local tourist spot. Although Lumut itself was quite small, we weren't far from the town of Seri Manjung, which is a fairly recently developed area. In Seri Manjung, there is a large shopping mall anchored by an excellent Aeon store (grocery and department store), several other smaller stores (bookstore, hairdresser, etc. ), a number of restaurants (including a Starbucks) and also a movie cinema. In addition to the Aeon Mall, there were a couple of other large grocery stores (Tesco and Giant) in Seri Manjung, and a brand new Pantai private hospital. Just beyond Seri Manjung is the town of Sitiawan (population of ~100,000), which is an older town, with a number of established businesses and shops. 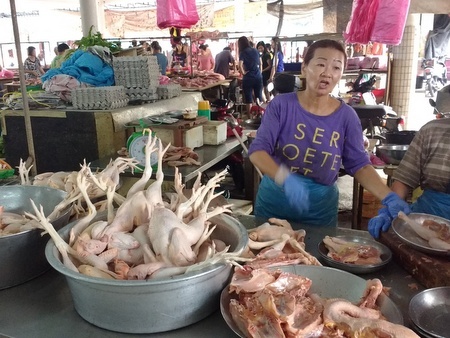 In Sitiawan, there is also a daily morning market where the choices for fresh produce and meats were excellent. 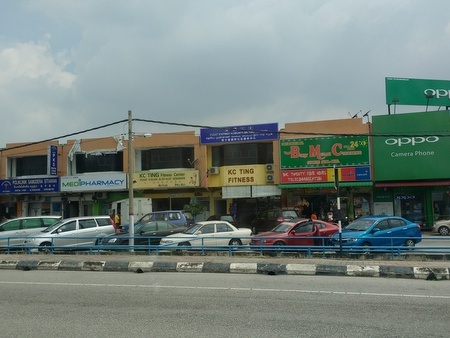 In addition to the mall in Seri Manjung, the streets are lined with small shops. requires local knowledge. The marina staff was quite helpful in directing us. 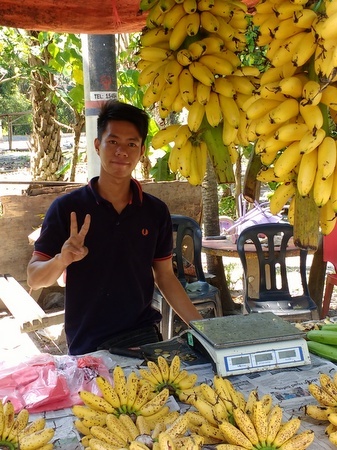 roadside stand to buy bananas. the lady was kind enough to remove the head and feet for her. Despite the rain delays on our painting project, life in general was quite good. The area where we lived had a small town feel, and we really liked that. 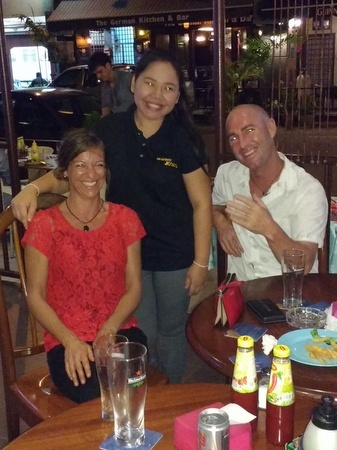 The local people were very friendly to us - people often asked where we were from and made us feel very welcome. The area also felt very safe and secure. One time, Rich forgot his backpack hanging on a grocery cart, and we were all the way home before we realized it. We drove back to the grocery store and found our cart near the place where we had left it (pushed off to the side a bit by the cart collectors), and the backpack still hanging on it untouched. Many of the local people speak English, for which we were incredibly grateful. 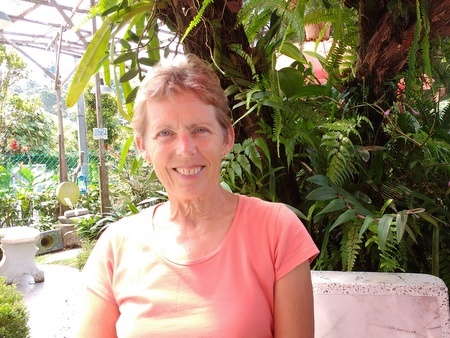 English is presently a compulsory subject in Malaysian schools, so the younger generation speaks it, as does the older generation (50+) because it was taught in school when Malaysia was a British Colony. (Malaysia became an independent nation in 1963.) However, there is a generation that missed out on the opportunity to learn English because in the 1970's, there was an emphasis on teaching only in the local Malay language (Bahasa Melayu). By the 1980's, Malaysia realized it was doing a disservice to their citizens by not teaching English because of the prevalence of communication in English in business, and it was put back into school curricula. Today, many businesses advertise in English and some even use English for communication within their organizations. All of the doctors, medical and hospital staff that we dealt with spoke English. Also, we listened to an English-language radio station called Lite FM - the DJ's on that radio station spoke English so well that their accent could have passed for American. Because so many locals speak English, we admittedly did not make any effort to learn much Bahasa Melayu. However, most road signs were in Bahasa, and the Google Translate app on our phone was quite helpful with that. 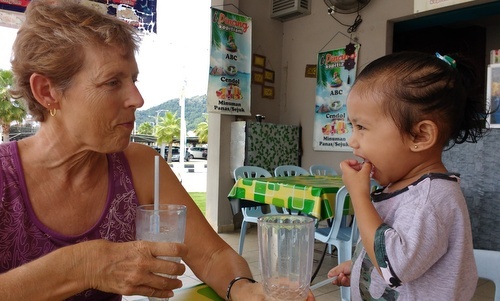 Jan learned quickly that "karankan laju" meant "slow down," and she reminded Rich of that on numerous occasions. We did learn to say "thank you" in Bahasa - "terimah kasih" - and when we used it, we almost always got a smile with the response "somo somo." In the Bahasa language, a singular noun is often repeated to make a plural word - for instance, the word for island is "pulau" and the word for islands is "pulau pulau". This carried over into a couple of local English colloquialisms which we heard quite often - "can can" and "same same." When we asked our painter Jimmy if he could use a different non-skid application in the cockpit vs. the decks on Slip Away, he replied "can can". When we asked if there was a difference in price, he replied "no - same same". One of the Asian customs which we found endearing is the habit of referring to elders as "uncle" and "aunty." Jimmy's crew of young guys who worked on the boat always called Rich "uncle." Malaysians like to eat out, and options for meals range from a roti (tortilla) at a roadside stand to a casual bite to eat at a cafe ("kopitiam"), lots of buffet options and also sit-down restaurants with a serving staff. Lunch at a local Malay cafe cost about MYR 15 (USD $3.50) for the two of us (USD $1.75 per person!). It was actually cheaper to go out to some of those places than it was to buy and cook our own food. The food was reasonably good, but the cheap local food was not always healthy, so we still ate a number of meals at home. Since the Malaysian population is primarily a mix of Malays, Chinese and Indians, there are a variety of Asian cuisines from which to choose, as well as a few restaurants serving Western Food. And Malaysia has not escaped the invasion of American fast food. Malaysians love fried chicken, so KFC was quite popular with the locals. There were also two McDonald's in Seri Manjung - McD's has fried chicken on their menu here, but much to Rich's dismay, no quarter-pounders! Pizza Huts were ubiquitous, and the Domino's Pizza in Lumut delivered to our apartment - nice! Restaurants that wanted to include Muslims in their customer base did not serve pork on their menus, and advertised as "Halal" establishments. In grocery stores, there was a separate "Non-Halal" area, where pork and alcohol were sold. Vasantha Bavan Indian Restaurant, and we ate there several times. 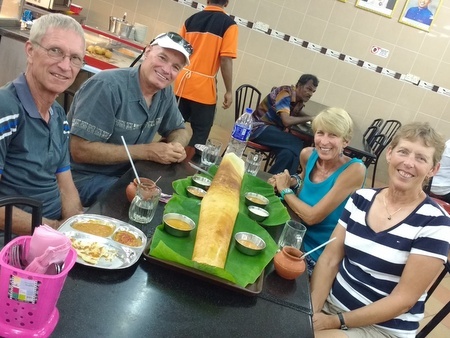 On this visit, Dave ordered the family-size dosai. On Friday nights, we could usually be found at Jook's Joint down the street from our apartment, Jook's was one of the local restaurants that served Western food, and the staff there is super friendly. On Friday nights, Jook's had a barbeque - grilled steaks, chicken, lamb and seafood (but no pork), along with a buffet of scalloped potatoes, fries (chips), salads, fruit and bread. Their filet steaks were some of the most tender and tasty we've ever eaten, and the buffet food was delicious too. Though it was expensive by Malaysian standards - our total bill was around USD $25 for two filet steaks and two beers - we know we can't get a meal like that in the U.S. for that price. Jook's was also the venue of choice for several birthday celebrations. Having a car was essential for us here because there wasn't good public transportation available. However, driving was not a joy. Many Malaysians are REALLY bad drivers, and we wonder if some of them have had no formal training. Some drive 20 kph under the speed limit, while others drive 20 or more kph over the speed limit. Many drivers wander across lanes, and some seem to think that the white dashed line on the road separating lanes is a lane because they drive on top of it. Intersections with traffic lights operate differently in Malaysia (or at least in our part of Malaysia) than in any other place in the world we've visited. Only one branch of the intersection gets a green light at a time, while the other three have a red light. We speculate that if they let opposing lanes of traffic go at the same time, there would be too many crashes! At less busy intersections, red lights are not always obeyed. And, when a red light turns green, one needs to be patient because acceleration is not a strong suit among Malaysians. 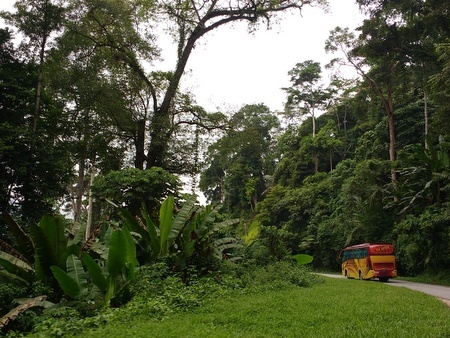 We preferred to avoid driving at night, but one time we had to drive home from Ipoh at night and in the pouring rain. That was an especially harrowing experience - the lines in the road are not painted with reflective paint, so it was extremely hard to see. Rich did an exceptional job of getting us back to Lumut safely. There are not only a lot of cars on the roads, but also a lot of motorbikes - mostly scooters. Some of the motorbikers stay to the left and out of the flow of automobile traffic (Malaysia drives on the left like the Brits), but others don't. 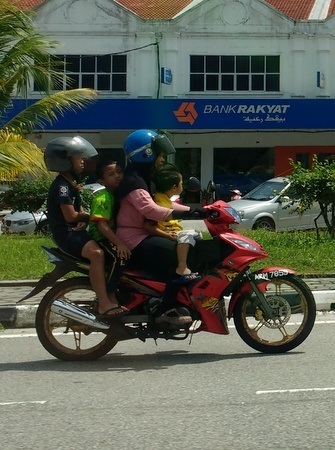 Occasionally, if it's more convenient, a motorbiker might ride on the right side of the road. On holidays and Sunday afternoons, teenagers were sometimes out riding their motorbikes in big groups, and they would zoom around cars like a plague of locusts. It was actually quite scary at times - we were worried that they would crash and fall right in front of our car. Our rental car was a Proton, which is a manufactured in Malaysia. It was a reliable car but not a great driving car - the turning radius was terrible, and some parking garages in Malaysia (including the one at our apartment) are quite tight. Cars manufactured and sold in this part of the world come with an air conditioner, but no heater, but that makes sense - who needs a heater when it's always 90F (32C) outside? Unfortunately, the local cars have not yet adopted some of the safety features (like airbags) that we take for granted in U.S. cars. Also, there are no car seats for kids here. law, but it wasn't always obeyed. brought back a little present to our friends Ben & Belle. It was fairly easy to find our way around with the help of Google Maps and Waze, although precise locations of some of the smaller businesses were not always accurate. It was better to ask directions from someone in the marina office, and directions were always given using landmarks, never street names. 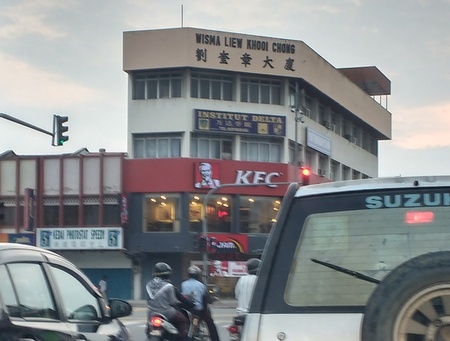 Whenever we wanted to go somewhere in Sitiawan, directions were always given in relation to a large KFC which sat at a major intersection of two streets the names of which we never knew. We were able to find the dentist office when we were told it was across the street from the Hotel Sofera, and the fire extinguisher shop was located next to the Secret Recipe Restaurant. (We got lost going to both of those places!) Fortunately, the Lumut Valley Resort Condominium building was located correctly on Google Maps, so we could always find our way home. directions to shops, and much more. began at this KFC corner. We celebrated a number of holidays in Malaysia, actually quite a few holidays. Since the Malay population is multicultural, they celebrated Diwali (Hindu Festival of Lights) in late October, Christmas on December 25, New Year's Day on January 1, Chinese New Year in late January, Thaipusam (another Hindu holiday) in early February, Labor Day on May 1, Wesak Day (Buddha's Birthday) also in May, Ramadan (the holiest month for Muslims, during which they fast from dawn to dusk) from May 26 to June 24 in 2017, and Hari Raya Aidilfitri (a month of celebrations after Ramadan). Fabio & Lisa (s.v. Amandla). after the sun went down. The owner of Marina Island (where the marina and boatyard are located) is a Christian (Methodist) Chinese, and hosted a very large Christmas Day celebration at the marina waterfront, with staged music, singing and dance performances by the locals. The yachties were invited to attend, and we were asked if we could contribute with a short program that reflected our international make-up. Our friend Sue (s.v. Spruce, British) rallied the troops, which was a bit like herding cats. We sang some Christmas carols (albeit a bit off-key), Sue played the flute, Chris & Belinda (s.v. Nahanni, Canadian) wrote and read a poem about the Great White North, Jan & Monique (s.v. Evia Blue, Dutch) sang a traditional Dutch Christmas song, and Jan represented the USA by reading "T'was the Night Before Christmas." Rod (s.v. Psycho Puss, Australian) dressed as Santa, and he and his wife Heather were a hit with the kids. A Chinese buffet dinner was served with lots of noodles and rice, very different from our traditional turkey or ham dinner, but it was all quite delicious and a fun evening. One final comment about Christmas - although the Muslims and most of the Indians do not celebrate Christmas, many of them wished us a Merry Christmas. Christmas Party was quite nice! Heather & Rod (s.v. Psycho Puss). in the bottle that Heather is carrying! yachtie contribution to the program. While work was progressing ever so slowly on Slip Away, we did get away from Lumut on a few occasions. Malaysia grants Americans a 90-day visitor visa, and each time that 90 days was nearing the end, we needed to leave the country on a "visa run." Our friends Sivea & Mario in Singapore welcomed us to visit them, and we did so a couple of times. In addition to the visa runs, we visited a few other places within Malaysia. The city of Ipoh is about 90 minutes from Lumut by car. It is the capital of the state of Perak, the third-largest city in Malaysia, and there are a few sights to see. We always meant to see the sights there, but never did. Whenever we went to Ipoh, it was for errands or doctor's appointments. treated Rich's shoulder last year. This time it was just a social visit. 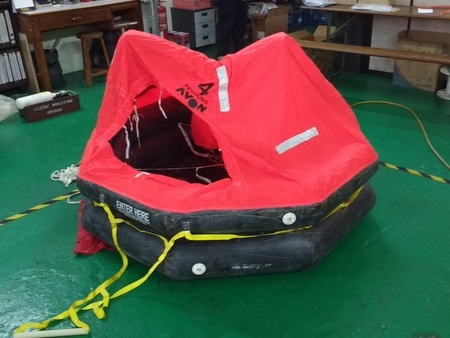 On one of our trips to Penang, we took our liferaft to an inspection facility there. Our 14-year old Avon liferaft (which was guaranteed for 12 years) failed miserably - the rubber in the tubes had deteriorated and it didn't hold air. By this time, we were already stressing about our ability to make the optimal timing for crossing the Indian Ocean due to the delays with the paint job. Sourcing and purchasing a new liferaft would take some time, so we decided that the Indian Ocean crossing would have to wait until next year. By mid-February, the paint job was wrapping up, and we started reinstalling all the deck hardware. As expected, reinstalling the hardware took a lot more time than removing it. Working in the heat and humidity was exhausting, and we didn't have the stamina to put in long hours. And, of course, we had more on our "to-do" list than just reinstalling the hardware. Slip Away finally went back in the water near the end of April. She had been on hardstand for a full year, the longest she'd ever spent out of the water under our ownership. We tied her up in a berth at the Pangkor Marina and continued to work on her. We reinstalled all the running rigging and the sails (including a new mizzen and head sail), new VHF antennas, and made some other repairs. Jan assisted Rich with some of the more technical jobs, and since we were still living in the apartment, she also took advantage of an opportunity to sand and re-varnish some areas of the interior. Slip Away was looking good! it was in the yard. 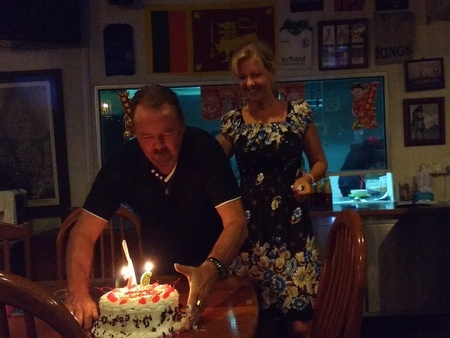 In June we were finally moving back on board and looking forward to making our exit from Pangkor Marina. Our new cruising plan was to take off by July 1, heading south and sailing around the tip of Singapore to visit some islands on the east side of the Malaysian Peninsula. But those plans also went down the drain. About that time, Rich developed a sore on his lip, and a dermatologist diagnosed it as an actinic cheilitis (aka sailor's lip). It was a pre-cancerous lesion, so not too serious, but it required treatment, which would take at least a month. Once again, time for a new plan! By this time, we really needed and wanted a break from both the boat work and from the heat, so we got in our car and drove up to the Cameron Highlands. 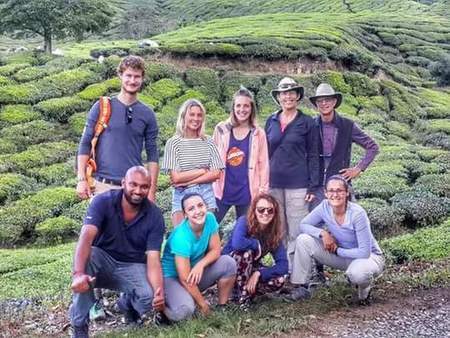 The Cameron Highlands are located on the highland spine of peninsular Malaysia, a 3½ hour drive from Pangkor Marina. The altitude varies from 3,500 to 6,700 feet (1,100 to 2,000 meters) above sea level, and the area enjoys a highland tropical climate with average temperatures ranging from about 60F (mid teens C) at night to the low 70'sF (low 20's C) during the day. It's an agricultural area, most famous for its tea plantations and strawberry farms. When we returned to Slip Away in the marina, we settled into life back on board the boat. Our air conditioner cranked away and kept the boat just cool enough. After having lived off Slip Away for over a year, it took a little while for us to get re-settled and stow everything in its respective place. We continued to work on some smaller boat jobs (there's always something on our to-do list! ), but we also took some time to relax and read and enjoy time with our boat neighbors. 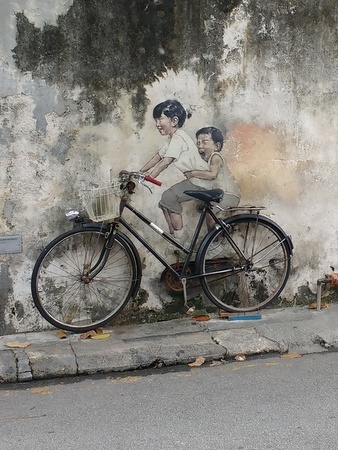 We did another road trip to Penang, and after leaving there, we stopped for an afternoon of sightseeing and a night in Taiping. 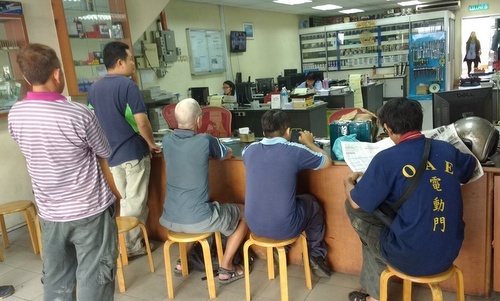 From Taiping, we drove to Ipoh, where we paid a visit to the Immigration Department. Our visitor visa was about to expire again, and this time, rather than go on a visa run, we applied for and were granted a 60-day visa extension. World War II cemetery in Taiping. and the Christians on the other. Many of the dead buried here were unidentified. Rich's lip responded well to treatment, and the doctor gave him the "all clear" by the end of July. Once that was behind us, we once again talked about taking off on Slip Away for the east side of Malaysia. But, after some discussion and thought, we decided to give this cruising season a pass. We were rather late in the season to be heading south. The Southwest Monsoon was reaching it's peak, which meant we'd likely be fighting headwinds the first 300 miles of the trip - not something we really wanted to do! Also, we had tickets booked to fly back to the U.S. at the end of September and felt we'd be rushed. So we made yet another new plan and moved our trip to the U.S. up to late August so we could enjoy a bit more time at home with family and friends. We'll come back to Malaysia in November and feel we'll have sufficient time to cruise Malaysia and Thailand before we head off on our Indian Ocean crossing in May next year. Since we still had a few weeks until our departure for the U.S., we decided to book a trip to the island of Borneo. When we sailed through Indonesia in 2015, we had wanted to stop and see the orangutans on Borneo, but there were terrible fires on the island that year. The smoke and haze were awful, and given those conditions, we felt it would have been a less-than-optimal experience (and possibly dangerous), so we took a pass. Seeing the orangutans remained on our bucket list, and friends who have done this have raved about the experience. Orangutans are only found on the islands of Borneo and Sumatra in Southeast Asia, so this was something we wanted to do before we left the area. Tickets and a river trip are now booked. We'll visit Borneo just before we fly back to the U.S. As this webpage is going to press, we're wrapping up some chores on Slip Away and will be leaving for Borneo in a few days. Our most exciting recent news is that we have a new granddaughter, Cambra Mae Crowell, who was born on August 7, 2017 to Erik & Chrissy. 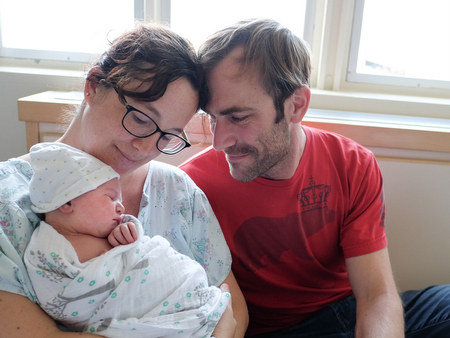 Mom, Dad and baby are doing well, and we can't wait to meet her!